The name Deykin is well known to those who study the history of clocks in and around the city of Worcester. This is not altogether surprising when we note that Thomas and Henry Deykin, father and son, were in business there for about eighty years and between them they made over one thousand four hundred clocks that we can count, as well as a further number unknown. Clocks by the Deykins were generally of good quality, which means that their names are becoming more widely known now amongst collectors and clock enthusiasts in general. We see occasional examples of their work, all but the very earliest bearing a serial number, but until recently we knew precious little about their lives. Now we have a better understanding of their dates and work, it seems like a good idea to set it down in print. Thomas Deykin was born in 1677 in Walsall in Staffordshire, the son of shopkeeper, Samuel Deykin. He married on 27th December 1703 at All Saints church in Worcester to Mary Meek, whose father was a manufacturer of brass and other metal items, which he sold at his shop in Broad Street, Worcester. It is in this shop that it is thought Thomas Deykin first set up in the clock business. Where he learned clockmaking remains unknown, and there seems to be no record of his apprenticeship. His early work has a hint of London styling about it in several respects. However, that may not be significant, as at this early period, London influence spread throughout southern England. Thomas had three children: Elizabeth who never married; Mercy who married a man named Ames; and Henry, who was born about 1715 and followed in his father's footsteps. Thomas Deykin probably began clockmaking about the year 1700, at which time he was twenty-one years old. We can probably assume that when he married in 1703 he was already earning a reliable living, or at least had the skills to do so. Most young tradesmen who had any sense deferred marriage till they could afford a bride - unless encouraged into early wedded bliss by a father-in-law with a shotgun, and we have no reason to assume that was the case with Thomas. If he was apprenticed, then his normal term of seven years would have ended when he was twenty-one. Apprentices were forbidden by the terms of their apprenticeship to marry during the term of training itself, and to do so meant abandoning that training very abruptly. This meant that many were desperate to marry as soon as that period was over. It may be significant that his bride's father was a merchant dealing in brass and metal objects. It is by no means impossible that Thomas learned his trade under Mr. Meek, as those who dealt in such objects were at that time also usually makers of them. Meek is not recorded as a clocksmith, but that does not mean he wasn't one. If this were so, then it would be by no means the first time the apprentice married his master's daughter. Such a relationship too would coincide with the likelihood of Thomas's setting up business in his father-in-law's premises. These are no more than suggestions, but in the absence of other evidence, they are as good as any. If Thomas was taught by his father-in-law to be, then he certainly had sophisticated London work as his model, as his clocks show none of the rustic heavy-handed work we often associate with a rural 'clocksmith'. 1. Dial of Henry Deykin's clock no 1422. This is a dial of the single-sheet type. Click for closer view. 2. Oak case of Henry Deykin's clock no. 1422. Click for closer view. Thomas Deykin numbered his clocks, though, like other clockmakers who did that, it seems he did not hit upon this idea from the very start of his career - since some clocks by him are reported without a number. I have taken to making a note of numbered Deykin clocks I have come across and that people have reported to me over the years, and these are set out below. One of the earliest numbered examples I know of is number 143 which by virtue of its inscription 'Long Live King George' and the Royal motto 'Honi Soit Qui Mal Y Pense', implies it was made about the time of the accession of King George II in 1727 - or could it have been for the accession of George I in 1714?. It gives us a suggestion of a dateline from which to begin calculating his yearly output. What we don't know is how many clocks he made before he began numbering. Oddly this particular number is on the lower edge of the main dial sheet, where it would barely show when the clock was in its case. Most of the (later) Deykin numbers were placed boldly with the name in the dial centre. It is thought that Thomas died in 1750. His highest numbered clock is said to be about 800, and one researcher suggests it was at about that number that Henry took over the business. The problem is that many of the numbers I have recorded against Henry's name, would appear to be numbers which ought to have occurred in Thomas's time. And there are other puzzling numbered ones which are said to be signed without a first name at all. There are presumably errors in either the reporting or the recording of these numbers, or both. They are however set out below for what they are worth. Some of these numbers and some other records of the two Deykins were passed to me by researchers who have studied the family. One researcher believes that Henry's numbering did not start till about 800, or perhaps even 700. But did he perhaps sign some clocks in his own right when his father was still alive? Thomas Deykin is recorded as a master clockmaker in the Inland Revenue tax records when he took certain apprentices. These were: 1714 Ann Clyde; 1717 John, son of Thomas Gauler of Hereford; 1720 Edward Fitzer. Ann Clyde was almost certainly taken as a domestic servant, or to learn the trade of Thomas's wife (typically as a milliner). Though girls were sometimes bound officially as apprentices to clockmakers, it was very seldom they actually practiced the trade, and those few which did were almost always cases where the apprentice was the daughter of a clockmaker. Nothing is heard again later of John Gauler or of Edward Fitzer. The assumption is that, if they survived, they either left the trade or worked as journeymen to Thomas and not in their own right. In fact the occurrence later of another Fitzer as Henry's apprentice, implies that Edward Fitzer may well have continued his association with Thomas Deykin. 3. Detail of the hood of Henry Deykin's clock no. 1422. Click for closer view. We do not know when Henry Deykin took over the business, though we do know it must have been by the year 1750. Henry was born in 1715 and was allegedly apprenticed to his father, though no apprenticeship bond seems to survive. Nor does there survive any record of a tax paid on an indenture with the Inland Revenue. Apprenticeships within the family were probably nor registered in the official tax-liable way, and this may even be why we have no record of Thomas's apprenticeship either. Henry would normally have been apprenticed at fourteen (1729) and freed from his apprenticeship at twenty one (1736). In May 1736 he was made a Freeman of the City of Worcester, which implies he had just ended his term. At this point in his life he was free to trade as a master clockmaker in his own right. The question we cannot answer is whether he did then make clocks in his own name from that date onwards, or whether he worked as an assistant to his father during the rest of the father's lifetime. 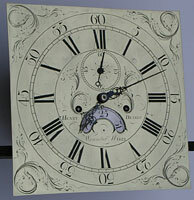 This means we cannot say whether the earliest of Henry's clocks date from 1736 or from 1750. We know Henry paid rates on the Broad Street property in 1755, by which time of course Thomas was long dead. Henry took certain apprentices of his own, duly recorded in the tax records. These were: 1754 William Rouse; 1758 Benjamin Fitzer (reputedly from London? ); 1772 David Thomas; 1779 Joseph Butler. Of these apprentices only William Rouse is known to have practised the trade in his own right later - more of him below. In 1746 Henry became a trustee of the Silver Street Baptist Chapel, then still living in All Saints parish, which included Broad Street. In November 1777 he leased further premises in Lich Street. Henry Deykin remained a bachelor all his life, and when, in 1779, Henry wrote his will, describing himself as a silversmith, his two sisters had already died before him. He left various bequests to the Baptist church in Worcester (the interest on £600.00), as well as bequests to other Baptist churches in Bewdley, Bridgnorth, Bromsgrove and Tewkesbury, and to Worcester Royal Infirmary, and to many cousins and other relatives. He desired to be buried in his father's grave at Silver Street Baptist Chapel, and so far as we know, he was. That graveyard no longer exists. But his main bequest was to leave his house, the business, including the workshops, 'cases and counters', and £100 in money to his 'faithful servant' William Rouse, obviously still working for Henry some twenty-five years after becoming his apprentice. Rouse worked on alone as a clockmaker at Worcester till the 1790s. Thomas Deykin: 143, 156, 176, 183, 227, 247, 279, 311, 358, 391, 407, 444, 466. Deykin without first name: 470, 572, 595. Henry Deykin: 82, 159, 595, 641, 649, 680, 720, 740, 800, 838, 952, 964, 973, 1001, 1052, 1054, 1077, 1107, 1111, 1115, 1139, 1161, 1207, 1211, 1222, 1239, 1338, 1364, 1370, 1377, 1422, 1447, 1474. Clearly some of these recorded numbers must be erroneous, as Henry could not have made clocks such as number 82, which must date well before 1727 (or even 1714? ), when he was still a child. Which other ones are incorrect, we have no way of being certain. It is part of the pleasure of researching such aspects of the clock trade that the more information we find, the more unanswered questions arise. Above is set out what we know so far about the Deykins. Clearly we have still a lot to discover, and that's no bad thing. If we knew all the answers there would be little point in continuing to study the clockmakers of the past. When we reach a certain age we see the truth in the old saying that it is better to travel hopefully than to arrive. The same goes for the pursuit of horological research.